Comprised of a set of compiler directives, OpenACC was created to accelerate code using the many streaming multiprocessors (SM) present on a GPU. Similar to how OpenMP is used for accelerating code on multicore CPUs, OpenACC can accelerate code on GPUs. But OpenACC offers more, as it is compatible with multiple architectures and devices, including multicore x86 CPUs and NVIDIA GPUs. Here we will examine some fundamentals of OpenACC by accelerating a small program consisting of iterations of simple matrix multiplication. Along the way, we will see how to use the NVIDIA Visual Profiler to identify parts of the code which call OpenACC compiler directives. 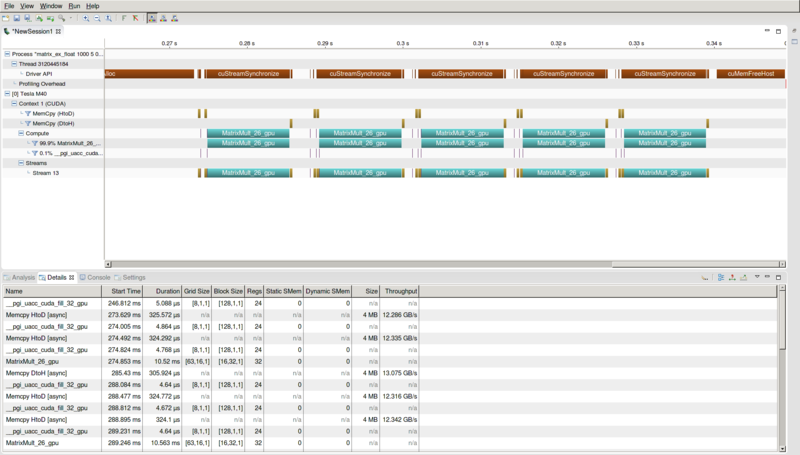 Graphical timelines displayed by the NVIDIA Visual Profiler visually indicate where greater speedups can be achieved. For example, applications which perform excessive host to device data transfer (and vice versa), can be significantly improved by eliminating excess data transfer. 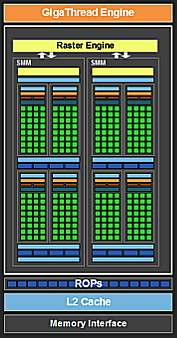 OpenACC is the result of a collaboration between PGI, Cray, and CAPS. It is an open specification which sets out compiler directives (sometimes called pragmas). Presently, the major compilers which support OpenACC are from PGI, Cray, and CAPS. The OpenACC Toolkit (which includes the PGI compilers) is available for download from NVIDIA and is made available for free to academic users. Non-academic users can sign up for a free 90-day trial. The free and open source GNU GCC compiler supports OpenACC 2.0a as an experimental feature (5.1 series and higher). No further enhancement of OpenACC support is planned for the GCC 5 series. Much improved support is expected for the GCC 6 series, but this is not expected to be available for at least another year (or likely longer, judging by timelines of previous releases). OpenACC facilitates the process of accelerating existing applications by requiring changes only to compute-intense sections of code, such as nested loops. A nested loop might go through many serial iterations on a CPU. By adding OpenACC directives, which look like specially-formatted comments, the loop can run in parallel to save significant amounts of runtime. Because OpenACC requires only the addition of compiler directives, usually along with small amounts of re-writing of code, it does not require extensive re-factoring of code. For many code bases, a few dozen effectively-placed compiler directives can achieve significant speedup (though it should be mentioned that most existing applications will likely require some amount of modification before they can be accelerated to near-maximum performance). OpenACC is relatively new to the set of frameworks, software development kits, and programming interfaces available for accelerating code on GPUs. In June 2013, the 2.0 stable release of OpenACC was introduced. OpenACC 2.6 is current as of December 2017. The 1.0 stable release of OpenACC was first made available in November, 2011. By reading OpenACC directives, the compiler assembles CUDA kernels from each section of compute-intense code. Each CUDA kernel is a portion of code that will be sent to the many GPU Streaming Multiprocessor processing elements for parallel execution (see Figure 1). The Compute Unified Device Architecture (CUDA) is an application programming interface (API), which was developed by NVIDIA for the C and Fortran languages. CUDA allows for parallelization of computationally-demanding applications. Those looking to use OpenACC do not need to know CUDA, but those looking for maximum performance usually need to use some direct CUDA calls. This is accomplished either by the programmer writing tasks as CUDA kernels, or by calling a CUDA ‘drop-in’ library. With these libraries, a developer invokes accelerated routines without having to write any CUDA kernels. Such CUDA ‘drop-in’ libraries include CUBLAS, CUFFT, CURAND, CUSPARSE, NPP, among others. The libraries mentioned here by name are included in the freely available CUDA toolkit. While OpenACC makes it easier for scientists and engineers to accelerate large and widely-used code bases, it is sometimes only the first step. With CUDA, a more extensive process of code refactoring and acceleration can be undertaken. Greater speedups can be achieved using CUDA. OpenACC is therefore a relatively easy first step toward GPU acceleration. The second (optional), and more challenging step requires code refactoring with CUDA. There are several tools available for reporting information on the parallel execution of an OpenACC application. Some of these tools run within the terminal and are text-based. The text reports can be generated by setting particular environment variables (more on this below), or by invoking compiler options when compiling at the command line. Text reports will provide detail on which portions of the code can be accelerated with kernels. 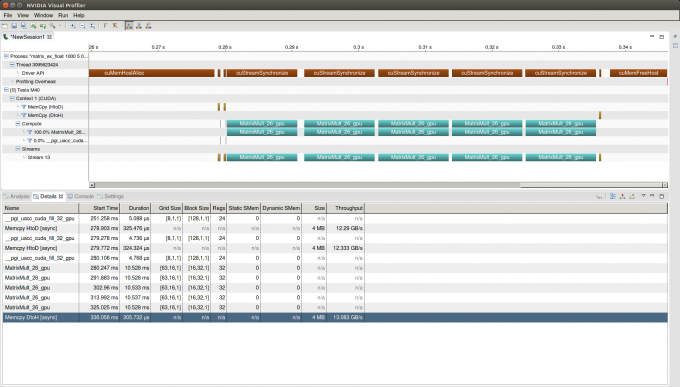 The NVIDIA Visual Profiler, has a graphical interface which displays a timeline detailing when data transfers occur between the host and device. Kernel launches and runtimes are indicated with a colored horizontal bar. The graphical timeline and text reports in the terminal together provide important information which could indicate sections of code that are reducing performance. By locating inefficiencies in data transfers, for example, the runtime can be reduced by restructuring parallel regions. The example below illustrates a timeline report showing excessive data transfers between the system and the GPU (the host and the device). Figure 2 Be sure to include the stdio.h and stdlib.h header files. Without these includes, you may encounter segmentation faults during dynamic memory allocation for 2D arrays. Download the source code here. The serial runtime, for five iterations with 1000x1000 matrices, is 7.57 seconds. Using larger 3000x3000 matrices, with five iterations increases the serial runtime to 265.7 seconds. The procedure-calling iterative loop within main() cannot, in this case, be parallelized because the value of matrix A depends on a series of sequence-dependent multiplications. This is the case with all sequence-dependent evolution of data, such as with time stepped iterations in molecular dynamics (MD). In an obvious sense, loops performing time evolution cannot be run in parallel, because the causality between discrete time steps would be lost. Another way of stating this is that loops with backward dependencies cannot be made parallel. With the application presented here, the correct matrix product is dependent on the matrices being multiplied together in the correct order, since matrix multiplication does not commute, in general. If the loop was run in parallel, the outcome would be unpredictable, and very likely not what the programmer intended. For example, the correct output for our application, after three iterations, takes on the form AxBxAxBxB. This accounts for the iterative reassignments of A and B to intermediate forms of the product matrix, C. After four iterations, the sequence becomes AxBxAxBxBxAxBxB. The main point: if this loop were to run in parallel, this sequence would very likely be disrupted into some other sequence, through the uncontrolled process of which threads, representing loop iterations, execute before others on the GPU. #pragma acc parallel Start parallel execution on the device. The compiler will generate parallel code whether the result is correct or not. #pragma acc kernels Hint to the compiler that kernels may be generated for the defined region. The compiler may generate parallel code for the region if it determines that the region can be accelerated safely. Otherwise, it will output warnings and compile the region to run in serial. #pragma acc region Define a parallel region where the compiler will search for code segments to accelerate. The compiler will attempt to automatically parallelize whatever it can, and report during compilation exactly what portions of the parallel region have been accelerated. Along with directives, there can be modifying clauses. In the example above, we are using the kernels directive with the pcopyin(list) and pcopyout(list) clauses. These are abbreviations for present_or_copyin(list), and present_or_copyout(list). pcopy(list) tells the compiler to copy the data to the device, but only if data is not already present. Upon exiting from the parallel region, any data which is present will be copied to the host. pcopyin(list) tells the compiler to copy to the device if the data is not already there. pcopyout(list) directs the compiler to copy the data if it is on the device, else the data is allocated to the device memory and then copied to the host. The variables, and arrays in list are those which will be copied. present_or_copy(list) clauses avoid the reduced performance of excessive data copies, since the data needed may already be present. The -Minfo flag is used to enable informational messages from the compiler. These messages are crucial for determining whether the compiler is able to apply the directives successfully, or whether there is some problem which could possibly be solved. For an example of a compiler message reporting a warning, see the section ‘Using a Linearized Array Instead of a 2D Array’ in the next OpenACC blog, entitled ‘More Tips on OpenACC Code Acceleration‘. Note that there are two Host to Device transfers of matrices A and B at the start of every iteration. Data transfers to the device, occurring after the first transfer, are excessive. In other words, every data copy after the first one is wasted time and lost performance. Now matrices A and B are copied to the device only once. Matrix C, the result, is copied to the Host at the end of the kernel region in MatrixMult() on every iteration. As shown in the table below, the runtime improvement is small but significant (1.9s vs. 1.5s). This reflects a 19.5% decrease in runtime; a speedup of 1.24. Table 2 Runtimes for five iterations of matrix multiplication (C=AxB). As data sizes increase, the amount of work grows and the benefits of parallelization become incredibly clear. For the larger 3000x3000 matrices, a speedup factor of 172 is realized when both kernels and data directives are used. The results were gathered on a Microway NumberSmasher server with dual 12-core Intel Xeon E5-2690v3 CPUs running at 2.6GHz. Runtimes were gathered when executing on 6, 12, and 24 of the CPU cores. This is achieved by setting the environment variable OMP_NUM_THREADS to 6, 12, and 24 respectively. It is clear that OpenMP is able to provide parallelization and good speedups (nearly linear). However, the GPU accelerators are able to provide more compute power than the CPUs. The results in Table 4 demonstrate that OpenMP and OpenACC both substancially increase performance. By utilizing a single NVIDIA Tesla M40 GPU, OpenACC is able to run 6.71 faster than OpenMP. Table 4 Relative Speedups of OpenACC and OpenMP for 3000x3000 matrices. The full OpenMP C source code can be downloaded here. As previously mentioned, OpenACC shares some commonality with OpenMP. Both are open standards, consisting of compiler directives for accelerating applications. Open Multi-Processing (OpenMP) was created for accelerating applications on multi-core CPUs, while OpenACC was primarily created for accelerating applications on GPUs (although OpenACC can also be used to accelerate code on other target devices, such as multi-core CPUs). Looking ahead, there is a growing consensus that the roles of OpenMP and OpenACC will become more and more alike. On Microway’s GPU Test Drive Cluster, some of the Compute Nodes have a mix of GPUs, including two Tesla M40 GPUs labelled as devices 0 and 5. To see what devices are available on your machine, run the command deviceQuery, (which is included with the CUDA Toolkit). pgaccelinfo, which comes with the OpenACC Toolkit, reports similar information. When an accelerated application is running, you can view the resource allocation on the device by executing the nvidia-smi utility. Memory usage and GPU usage, listed by application, are reported for all GPU devices in the system. Although CUDA and OpenACC both use similar ideas, their terminology differs slightly. 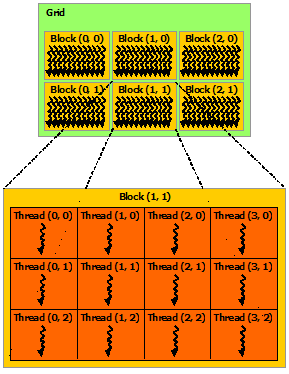 In CUDA, parallel execution is organized into grids, blocks (threadBlocks), and threads. 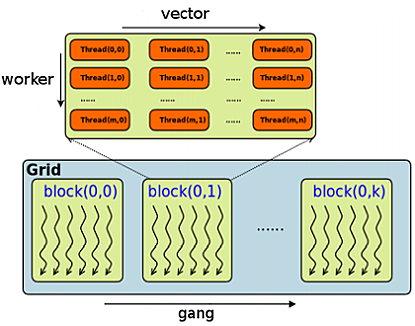 In OpenACC, a gang is like a CUDA threadBlock, which executes on a processing element (PE). On a GPU device, the processing element (PE) is the streaming multiprocessor (SM). A number of OpenACC gangs maps across numerous PEs (CUDA blocks). An OpenACC worker is a group of vectors. The worker dimension extends across the height of a gang (threadBlock). Each vector is a CUDA thread. The dimension of vector is across the width of the threadBlock. Each worker consists of vector number of threads. Therefore, a worker corresponds to one CUDA warp only if vector takes on the value of 32; a worker does not have to correspond to a warp. For example, a worker can correspond to two warps if vector is 64, for example. The significance of a warp is that all threads in a warp run concurrently. Figure 6 A CUDA grid consists of blocks of threads (threadBlocks), which can be arranged in one or two dimensions. Figure 6 illustrates a threadBlock, represented as part of a 2D grid containing multiple threadBlocks. In OpenACC, the grid consists of a number of gangs, which can extend into one or two dimensions. As depicted in Figure 7, the gangs extend into one dimension. It is possible, however, to arrange gangs into a two dimensional grid. Each gang, or threadBlock, in both figures 6 and 7 is comprised of a 2D block of threads. The number of vectors, workers, and gangs can be finely tuned for a parallel loop. Sometimes it is faster to have some kernels execute more than once on a block, instead of having each kernel execute only once per block. Discovering the optimal amount of kernel re-execution can require some trial and error. In OpenACC, this would correspond to a case where the number of gangs is less than a loop layer which is run in parallel across gangs and which has more iterations than gangs available. In CUDA, threads execute in groups of 32 at a time. Groups of 32 threads, as mentioned, are called warps, and execute concurrently. In Figure 8, the block width is set to 32 threads. This makes more threads execute concurrently, so the program runs faster. Figure 7 An OpenACC threadBlock has vertical dimension worker, and horizontal dimension vector. The grid consists of gang threadBlocks. Figure 8 OpenACC code with gang and vector clauses. The fully accelerated OpenACC version of the C source code can be downloaded here. The directive clause gang(100), vector(32), on the j loop, sets the block width to 32 threads (warp size), which makes parallel execution faster. Integer multiples of a warp size will also realize greater concurrency, but not usually beyond a width of 64. The same clause sets the grid width to 100. The directive clause on the outer i loop, gang(100), vector(32), sets the grid height to 100, and block height to 32. The block height specifies that the loop iterations are processed in SIMT groups of 32. By adding the gang and vector clauses, as shown in Figure 8, the runtime is reduced to 1.3838 sec (a speedup of 1.12x over the best runtime in Table 2). OpenACC is flexible in its support for GPU, which means support for a variety of GPU types and capabilities. The target options in the table below illustrate how different compute capabilities, GPU architectures, and CUDA versions can be targeted. Although we have focused here on using OpenACC in the C programming language, there is robust OpenACC support for the Fortran language. The syntax for compiler directives is only slightly different. In the C language, with dynamic memory allocation and pointers, pointers must be restricted inside of parallel regions. This means that pointers, if not declared as restricted in main(), or subsequently cast as restricted in main(), must be cast as restricted when passed as input arguments to routines containing a parallel region. Fortran does not use pointers and handles memory differently, with less user control. Pointer-related considerations therefore do not arise with Fortran. OpenACC is a relatively recent open standard for acceleration directives which is supported by several compilers, including, perhaps most notably, the PGI compilers. Accelerating code with OpenACC is a fairly quick route to speedups on the GPU, without needing to write CUDA kernels in C or Fortran, thereby removing the need to refactor potentially numerous regions of compute-intense portions of a large software application. By making an easy path to acceleration accessible, OpenACC adds tremendous value to the CUDA API. OpenACC is a relatively new development API for acceleration, with the stable 2.0 release appearing in June 2013. 14.) Profiling and Tuning OpenACC Code. Cliff Woolley, GPU Technology Conference. My background in HPC includes building two clusters at the University of Massachusetts, along with doing computational research in quantum chemistry on the facilities of the Massachusetts Green High Performance Computing Center. My personal interests and academic background encompass a range of topics across science and engineering. In recent work, I used the GAMESS quantum chemistry package in order to study theoretical highly strained hydrocarbon structures, derived from prismane building blocks. I also recently authored a small software application in Python for generating amorphous cellulose within a periodic space. This application was used for generating structures for further study in NAMD and LAMMPS. Prior to doing research in Quantum and Materials Chemistry, I worked on problems related to protein folding and docking. It is very exciting, especially, to be involved with applications of GPU computing to these, as well as to other scientific questions. For several years, while not doing research, I was a consulting software engineer and built a variety of internet and desktop software applications. As an HPC Sales Specialist at Microway, I greatly look forward to advising Microway's clients in order to provide them with well-configured, optimal HPC solutions. This entry was posted in Development, Software, Test Drive and tagged CUDA, deep learning, gpu, K80, M40, OpenACC, OpenMP, tesla, Test Drive. Bookmark the permalink.